The call came on a Tuesday. 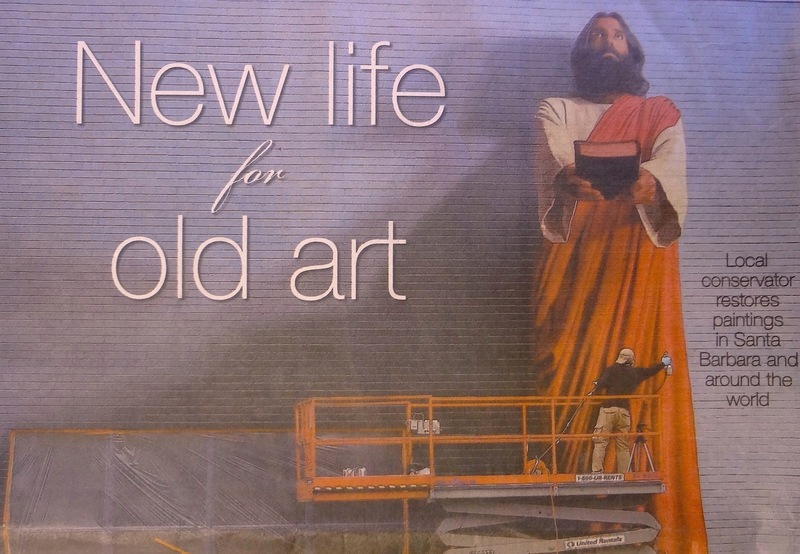 Could Scott M. Haskins fly to London to offer his expert opinion on whether a mural should be saved in a building that was about to be demolished? “I left Santa Barbara the next day, met with the construction people in London on Thursday, had the mural removed by Saturday, and demolition in the building began on Monday,” said Mr. Haskins. The mural, which is 6 feet tall and 20 feet wide on canvas, is now rolled up in a vertical column at the Fine Art Conservation Laboratories, where Mr. Haskins is director and chief conservator. 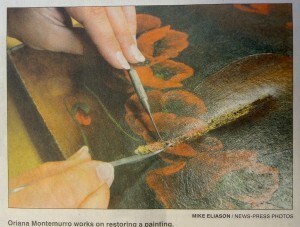 FACL specializes in conservation of easel paintings, murals, works of art on paper and period frames. “The mural was originally done for the 1964 Worlds Fair in New York City, and afterward it ended up in London. There is some flaking, and after I stabilize it, clean the front and back, and varnish it, I’ll prepare it for mounting in a new building in Rexburg, Idaho,” said Mr. Haskins during an interview at the unassuming facility on a one-block street near Santa Barbara High School. Scott Haskins is an art conservator who works on projects in his Santa Barbara laboratory and around the world. 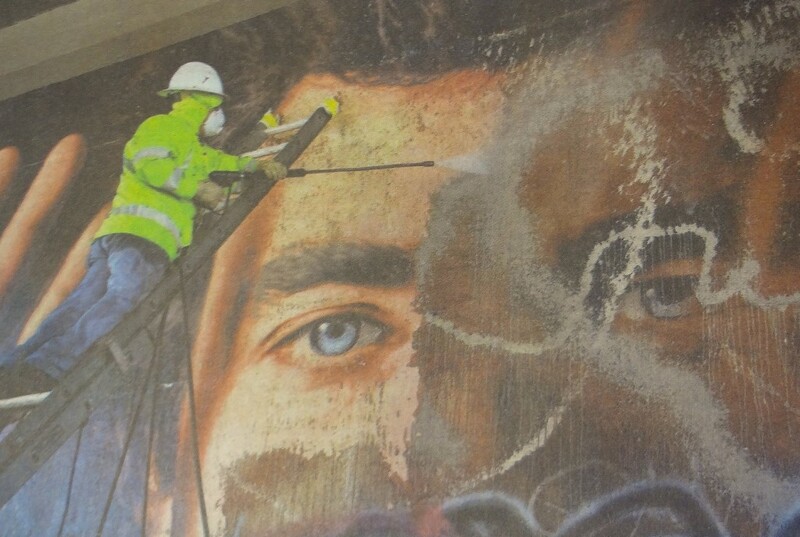 Above, a mural on Los Angeles freeway gets a scrubbing from Mr. Haskins. At top, Mr. Haskins varnishes a painting at Biola University in La Mirada. At right, at his headquarters in Santa Barbara. Projects such as these are all in a day’s work for the sandy- haired expert who performs services for clients throughout the country and world. He has just returned from a two-week project in Italy, where his passion for art conservation began in 1975 while studying for a master’s degree at a three-year painting conservation program at the Italian government run center, ENAIP in Botticino (Brescia). “The first week I was there, I was on scaffolding working on a mural dated 1365. It was in a monastery that was built in the year 900. I was 23 years old and thought I was the luckiest guy in the world,” said the 59 year old native of Whittier. A year or so earlier, he was a student at Brigham Young University in Provo, Utah, when an art history professor suggested he consider art conservation as a career. “I had no idea what it was, but it turned out to be the application of two interests I had since I was a child – art and science – to preserve and restore art,” said Mr. Haskins, who did eight months of post-graduate work in northern Italy after earning his master’s degree in 1978. That same year, he was offered a faculty position at BYU to start a laboratory that would provide conservation services for the university’s art collection and the historical collection of the Church of Jesus Christ and Latter-day Saints. “Although it was an exciting job, I left BYU in 1984 to come to Santa Barbara when a group of private investors asked me to set up a conservation lab that would attract business nationwide. It was on West Gutierrez Street until 1986 when it shut down because one of the invertors went bankrupt and everything (business’) associated with him was shut down,” Mr. Haskins said. Rather than accept offers from the Los Angeles Museum of Art and National Galleries of Art in Australia and New Zealand, he established Fine Art Conservation Laboratories (aka FACL, Inc.) in 1986 in the same location where it is today. “I opted to stay in Santa Barbara because I was married and had four children. They were in school, and we all liked Santa Barbara,” said Mr. Haskins, whose two daughters work with him at the laboratory. 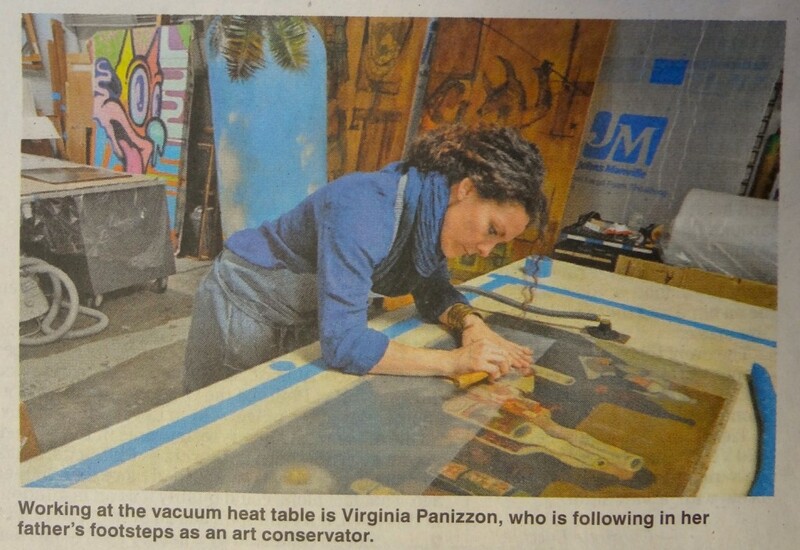 Virginia Panizzon, 35 is the head conservator and Francesca Ruggeri, 31, is the office manager. He also has two sons and three stepsons, whose mother is his wife, Diana Saavedra Haskins. The blended family includes eight grand children. 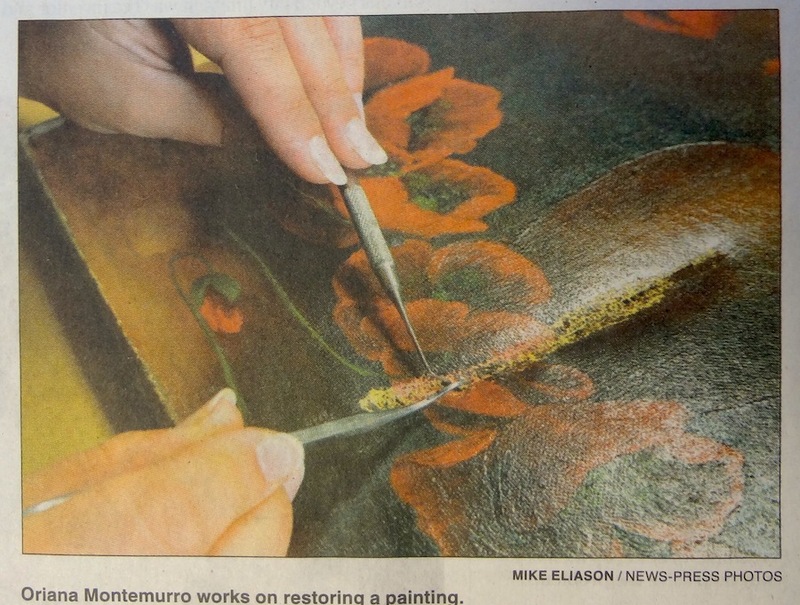 Mr. Scott Haskins works on a painting at his Fine Art Conservation Laboratories near Santa Barbara High School. When Mr. Haskins, who lives in Goleta, is not working on international projects, he spends his time at the local lab, working on “movable artwork” that is sent from all over the world. The mention of old masters reminded Mr. Haskins of a funny experience that he thinks about every time he looks at a small icon that hangs just outside his office door. The 12-by-14 inch oil on wood panel is a picture of Christ with two cherubs. “I got a call from a man in Las Vegas who said he had a priceless Russian Renaissance icon that he wanted me to evaluate. I told him I would charge him $200 to look at it. Several weeks later, a white Roll-Royce pulled up to the front door, and a uniformed chauffeur stepped out, and came into the lab, presented me with a package and left, not saying a word. “When I opened the package, it was the icon, which I saw immediately was not Russian. It was Italian. It was not from the Renaissance. The date was about 1850 and it was not priceless. It was worth about $200.” After confirming his opinion with another art dealer, Mr. Haskins called the man with his findings. He was furious and refused to pay me my fee. Finally after my repeated calls, he told me to keep the painting but warned me, “ If I find you have sold it at auction for $1 million, you’re a dead man.” “ He was serious, but I wasn’t worried” said Mr. Haskins. Before accepting a piece to restore, Mr. Haskins determines the needs of the client and the needs of the painting… sometimes, they are not the same. “A client may just want a quick surface clean and varnish but the painting may be flaking and need other important preservation treatments,” he explained. “For instance, we don’t patch rips in paintings.” To see his short video on why, go to YouTube and search for “How To Fix A Ripped Canvas” by bestartdoc. “After this initial evaluation, I discuss options and estimates with the client,” said Mr. Haskins, whose minimum fee is $250. His laboratory, which covers 2,400 square feet, is equipped with an 8 x 12 foot vacuum hot table, a low-pressure suction tabletop, polarizing microscope and a booth to spray varnish. “We use the microscope to identify fake signatures, pigments and painting structure,” explained Mr. Haskins during a tour of the facility. “The hot table is used to relax cracking in a painting, and the suction table pulls stains from artwork.” A large spray booth is set up to varnish oils and acrylics, the final step in the process and one that has been done for thousands of years according to Mr. Haskins, who also serves as an expert witness when there is litigation involving art-related issues. The most expensive assignment on which he has worked so far was the Fair Park Mural Conservation Project in Dallas.“ It cost $3 million and took two years to complete,’ said Mr. Haskins, who was the chief conservator for the team of 24 professionals and technicians. The murals in Dallas, which were painted in 1936 by Italian-American artist Carlo Ciampaglia, were painted out or covered, in 1942. The rediscovery and conservation of these important works of art were undertaken by the city of Dallas as part of the historical preservation effort at Fair Park. In Santa Barbara Mr. Haskins worked with a team of conservators, technicians and specialist to prepare the mural “Portrait of Mexico Today” by David Alfaro Siqueiros for the move from Los Angeles to Santa Barbara Museum of Art in 2002. He also helped perform the conservation work once it was installed at its new site to the right of the museum entrance. Mr. Haskins and his two- full –time art conservators, which include his daughter and Oriana Montemurro, work on 400 to 500 projects-here and away- in a year with help of interns from UCSB, Westmont College, Santa Barbra City Collage and student from abroad. “If it’s a large project, I bring in professionals from other parts of the US and the world – Italy, Germany, France, etcetera,” he said. The 1994 earthquake in Northridge, which caused major damage, inspired Mr. Haskins to add another dimension to his career-using his expertise to educate people about what they can do to save their valuable possessions when there is a disaster or an emergency. “After an earthquake, I got a call from a contact in the area. He said, ”Quick, I need you to write a pamphlet on how to respond after an earthquake to save your collectibles,” recalled Mr. Haskins. 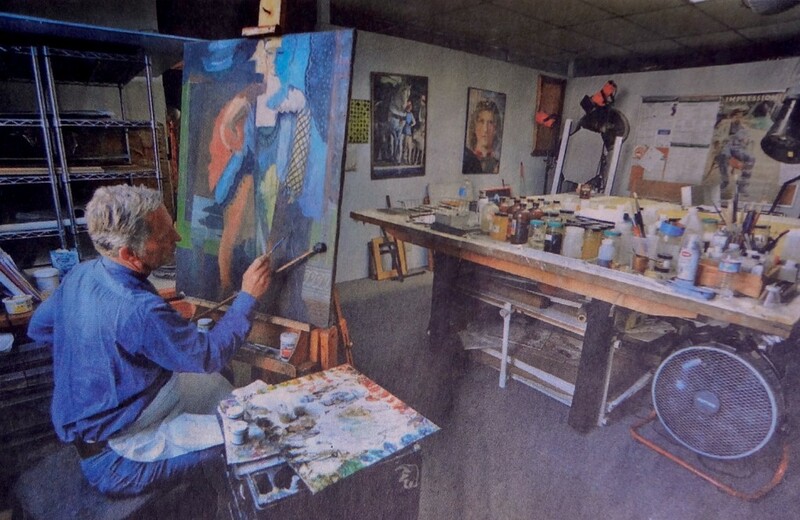 “It took me an afternoon to write, and over 500,000 copies of the the booklet were distributed by the human resources departments at Bank of America Corp.
Mike Eliason, News-Press photograher shooting Virginia Panizzon working on a painting on the hot table. 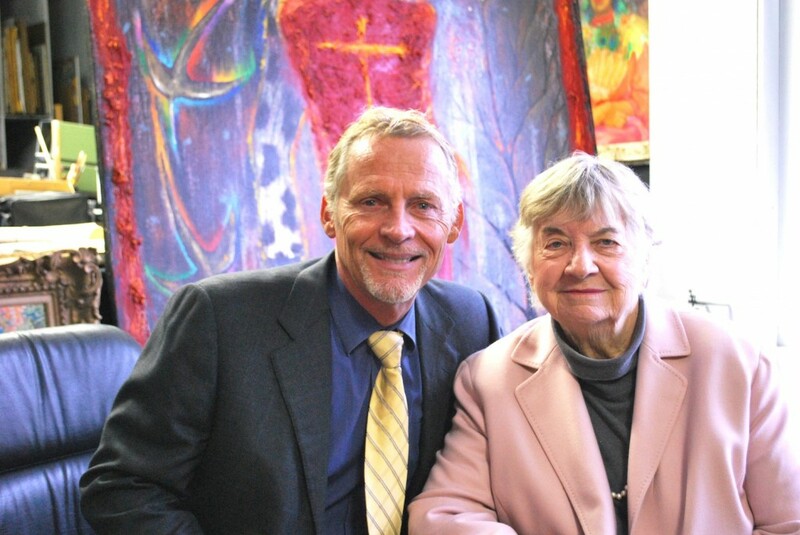 My name is Jim Glenn and I manage the State of Utah Alice Merrill Horne Fine and Folk Art Collections. Your email address info@fineartconservationlab.com bounced back. We are researching conservators in the western US, specifically painting conservators at this time. Would you be interested in talking with our Procurement Office and entering into a contract with the State of Utah for possible future conservation work we may need performed? Thank you. I will look forward to hearing from you. Hi all I’m Martin. Good post! Thx! Thx! Very inspiring and motivational,it’s just what I needed to hear. It’s very interesting to see your progress over a long timespan! We absolutely love your blog and find your post’s to be so educational and applicable to our situations as collectors. SO many suggestions result in saving money by avoiding problems. Again, awesome web log! Thanks! Thank you Sally for your recommendation! Scott M. Haskins is indeed a master art conservator with tons of high level experience, specializing in the conservation and restoration of paintings. We appreciate so much his working with us. Our relationship goes back years. I highly recommend Scott Haskins if you want a true expert to work on your art. He takes his time explaining any questions you have about the art that is presented to him. When I presented the painting that I wanted to be cleaned he recommended the steps to be taken as if it was his own. Scott Haskins was highly recommended to me by several Fine Art Galleries in the Monterey Peninsula and Santa Cruz areas. Thank you Charles for the compliments and respect. Art conservation is a profession that requires advanced learning (or at least understanding) on a science level and then craftsmanship exactness much like a surgeon, where much harm can be done if not aware and careful. The masters degree programs are 3 years in duration with post grad work adding 5 ore years to the process. All this is full time commitment. Another route more historical is the apprenticeship process but, of course, the trouble is finding someone who will look over your shoulder, full time, as you work for about an 8 year period. The quality of the teacher gets transferred to the student so, generally, more mistakes are usually passed instead of skills. You can imagine the reticence of teaching someone, no matter how well intentioned, enough to make them dangerous, when the purpose of our profession is to protect and preserve art. Some people are willing to go ahead and learn on their own… which means they have failed the 1st lesson, never do any harm and respect religiously all artwork… because with this method, “Damned the torpedoes, full speed ahead” is not an appropriate mantra for art conservation. 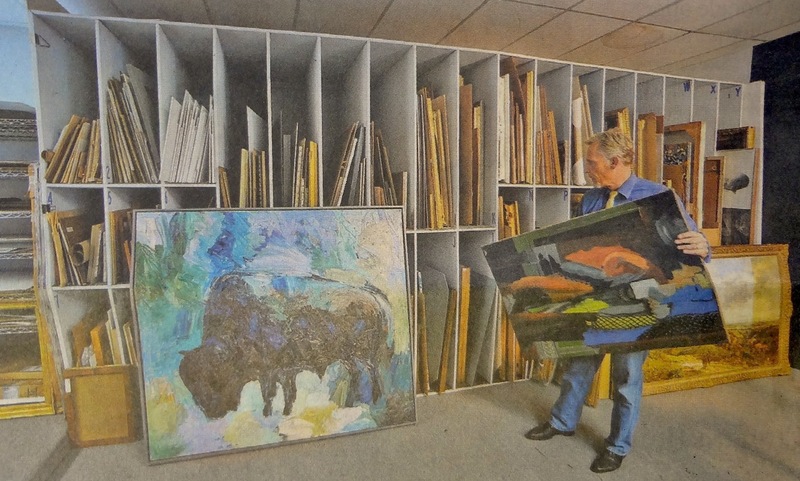 You might check with the art conservators in your area to see what opportunities exist. Anyway, I’ve since retired, moved to Colorado Springs and bought a beautiful 4k sq. ft. home with my new wife. P.S. I was an A student in College, and worked in a technical field at So. Ca. Edison for 28 years. If you have any interest in helping me, please email me. I going ahead with this no matter what, but I’ve always believed in getting the best education possible/within reason, and have a tremendous respect for your skill. I do hope you consider it. Hi Olivie, I’m looking forward to meeting with you. Please give us a call to set up a time 805 564 3438 btw… we will not charge you for the visit. Hi my name is Olivie and I just wanted to drop you a quick note here instead of calling you. I discovered your blog post telling about your cool newspaper article and loved it. I’ve got some artwork that I would like to look at with you. I assume this is something you do? I live in the West LA area. I have three painted murals, commissioned by me in 1977 by a local painter. Originally, these paintings graced the walls of a Mexican restaurant. The restaurant closed and the murals, on canvas, were stored. Damaged, torn and aged, my now sentimental murals are in a sad state. These paintings were created by a local artist who is no longer living. I would like to save these paintings, if financially reasonable. I paid approximately $3500 each. I would like to forward digital photos of each but, I am unable to attach my photos to this reply. I hope that you will be able to suggest a solution for me. I live in the East Bay of the San Francisco Bay Area. Thanks Nick. We’ve enjoyed working with you too and appreciate your confidence in us to work with us even over a long distance. Great post and coverage. We found out about Scott Haskins and FACL through an enthusiastic recommendation by Karges Fine Art in Los Angeles and Carmel, CA. FACL does top quality work.